Heather and Jeremy’s wedding ceremony and reception took place on the MS Dixie II paddle boat on Lake Tahoe. 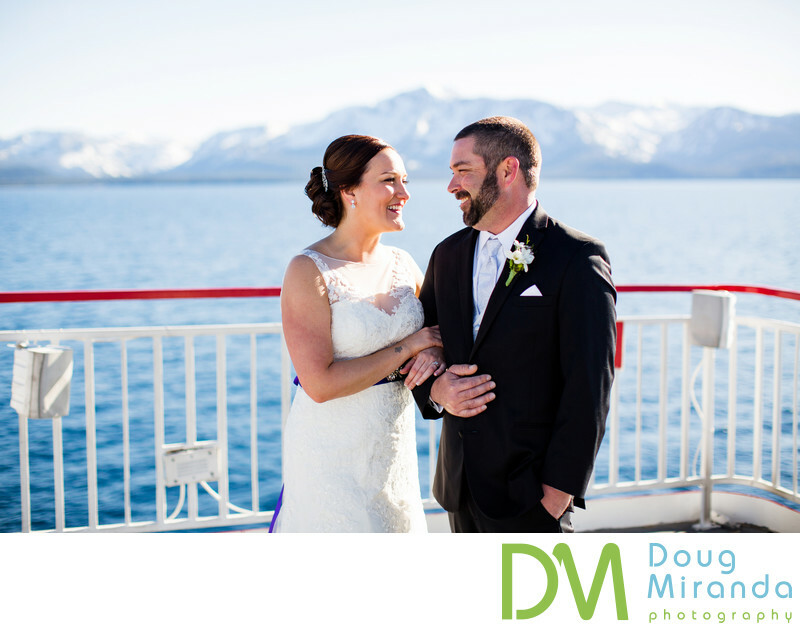 Heather and Jeremy love boats and boating, so they thought it would be great to actually get married on a boat in the middle of Lake Tahoe. At the end of April family and friends boarded the boat to see the two of them tie the knot. It was a cold and clear day in Tahoe with snow still on all the surrounding peaks in the Tahoe Basin. This photo was taken right after we finished their family portraits on the top deck of the boat. We were in the middle of the lake for their ceremony and for the family portraits. The captain of the boat gave me about five more minutes of staying still in the middle of the lake before had to start the boat again and drive to Emerald Bay. He had the boat positioned perfectly so that Heather and Jeremy were back lit. I worked fast and was able to take a good amount of pictures before we started moving again. This photograph is one of the many I captured in those five minutes we had. I enjoy looking at the genuine smiles they have on their faces and giddiness of them realizing that they are finally husband and wife.